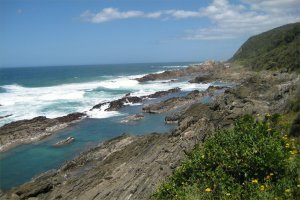 Capetown and the Garden Route. Finale of the Bluelist (3/3). 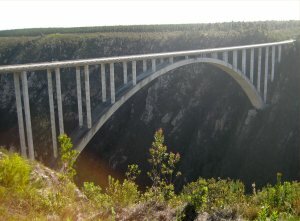 Up early, we drive to Blukrans bridge (a spectacular feat of engineering)Its the largest single span arch bridge in the world.People were saying at the time, it was the highest bungee jump in the world. Its actually the 3rd, the Macau Tower is the highest at 233m (but only 16m higher). I watch some lunatics jump of the bridge and it turns my stomach. 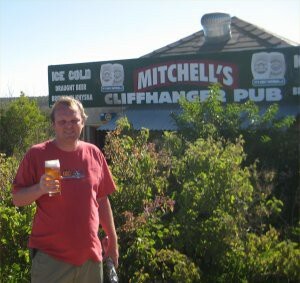 I decide to do the 2nd of the “must do’s” for the Garden Route and try some Mitchell’s beer.I wander over to the Cliffhanger pub and order a pint.The barman is the most miserable barkeep I have ever met. 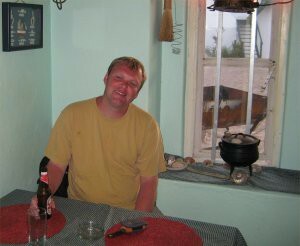 I pay him 200 rand (you would think he was paying me, from the look on his face) and take my beer outside for this photo. Turns out to be cask ale, which I don’t like. I swig half a pint, then give it back. Thoroughly disappointed, I head over to some stalls nearby to look at carved animals and cheer myself up. I buy a carved giraffe from some Zimbabwe traders, for 120 rand. Our guide explains that unemployment in neighbouring Zimbabwe has led its people to leave their homeland in search of work. 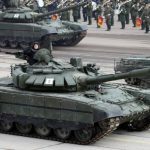 This has affected employment ins South Africa significantly. 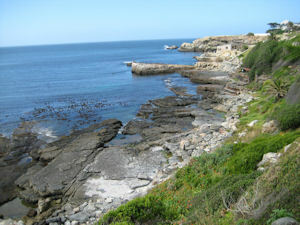 90 minutes later, and were at Storms river.We all set off to do the coastal walk. We cross a bolder field, and the ground is (obviously) quite uneven.A few people decide to not to continue, and for no particular reason, I decide to go with them. 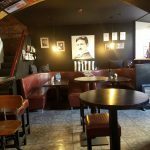 We find a nice cafe, and I have the fish cakes I have been wanting to eat all week, along with 2 really nice cups of coffee (it was one of those sort of non adventure days, when I just felt like relaxing). I pop into the shop and buy a small carved black lion (my collection of hand carved African animals is growing). There were some really nice chalets here, which some other Garden Route travellers were staying in. 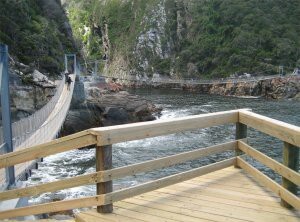 I wished we’d done the same.We headed out to visit the suspension bridge.The path through the Tsitsikamma National Park, was really relaxing and although steep in parts, was very even under-foot. 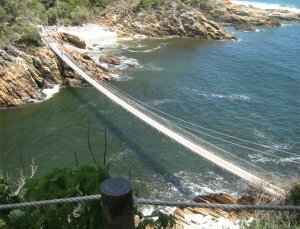 Turned out that there were several suspension bridges interconnected together.When I had crossed suspension bridges in Borneo, we were told to only cross, 1 person at a time. The sign next to these said no more than 25 people at a time ! 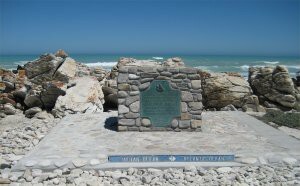 Next we travel to Cape Agulhas.This monument, marks the cape, the most southern point in Africa.My guidebook, said if you go swimming, swim on the left, as the Indian Ocean is warmer. In reality, it makes no difference. I’ve said before, that SA people, are fairy straight up and no nonsense. Its here where the common phrase “you cant swim to 2 oceans” takes its name. It means simply, don’t sit on the fence. I was surprised how quiet it was. No souvenir shops, hotels, ice cream vendors etc.Its also one of a few places on earth, that has zero declination (if you know about navigation, that will mean something to you, if not read this). 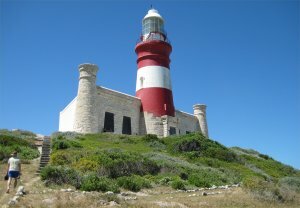 Cape Agulhas, means literally Cape of Needles in Portuguese, as its filled with tiny coral shards. 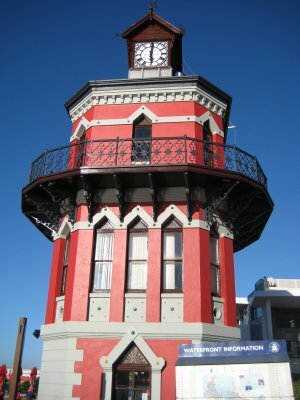 These have sunk around 250 vessels in the last 200 years.This lighthouse isn’t an old relic designed to look quaint, its actually fully functioning.It is reckoned to save thousands of lives every year as ships navigate the clipper route. 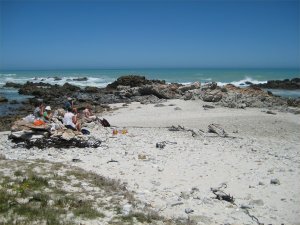 We continue driving to Hermanus and stop off for something to eat at a service station.You don’t see firewood, in many service stations in the UK.While here, I decided to buy a copy of FHM to read on the journey (I was a regular reader for 6 years, but went of it a bit. Since then its expanded, and there’s actually one written just for South Africa). They haven’t lost their way, and the magazine was full of “take the piss” articles. It kept mentioning Oke’s. I Didn’t know what that meant, but Charl explained it was South African slang for mates. 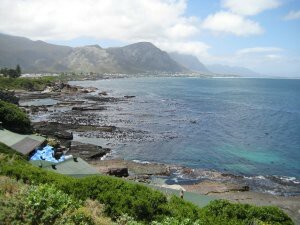 We arrive at Hermanus, the number one location in the world, for watching Whales from land.I was delighted to find that we are staying at a hotel right on the waterfront, near Walker Bay.I put my rucksack into my room, and head out exploring. There is a whale in the harbour. To me, it could be an old Tyre at that distance, but the locals recognise it by name. I sit looking out to sea, drinking a glass of lager, entertained by a xylophone player. 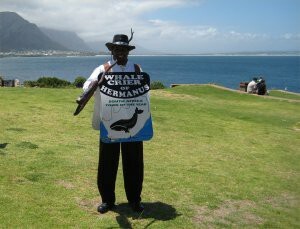 I see the famous Whale crier (a job unique in all the world, he blows his vuvusela when I whale is sighted (their common now, since the world cup, but it was the first time id seen (or heard one)).I try to photograph him, but some young South Africans with water pistols are causing him some discomfort and he beats a hasty retreat.He returns later, and I’m able to get this photo. As much as traveling, is about trekking in Borneo and meeting tribesmen, its also about experiencing modern culture, which years from now may be discussed with significance. 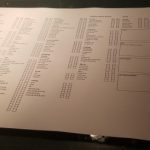 South Africa are due to play Rugby that afternoon. I find a bar to watch the game. Inside, there are several specific groups speaking privately. Xosa, Zulu, dozens of others I don’t know (there are 11 national language in SA) along with the 2 white tribes, British and Afrikaner. Then the match starts, and the pub just sort of merges into one unit (I’m not saying this out of romanticism, I saw it with my own eyes). Months after returning home, I would watch the film Invictus, which explained everything. Only sport can unify people in this way, after 400 years of separation and segregation. Its dark outside so I head back to the hotel. Hot chocolate and I watch Stargate Universe on my laptop. I find annoyingly, that one of the episodes has no sound. I watch it anyway and try to work out the plot from the pictures. Next morning I’m up early for breakfast. They have everything you could want, but no crusty buttered bread !.A group walk is scheduled for the morning, and optional whale watching boat trip in the afternoon. I decide to opt out of both, and have the day to myself.I find a coastal path along the harbour. The Fernkloof nature reserve, cliff path, which I follow for several miles. Every now and then I venture off the path and explore the coastal rocks and vegetation. Having set of early, I get back at 10:45. 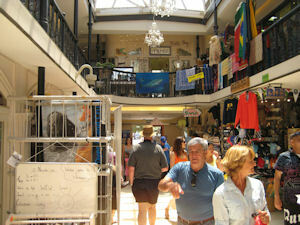 An organized tour of the town is scheduled for 11am, but only runs with a minimum of 2 people. With nobody else there, the very decent chap, refuses my offer of paying for 2, and recommends some key sites, and highlights of the towns 3 museums for nothing. I visit the photographic museum first. There are loads of interesting pictures, but best of all, is a sharks mouth, from the record breaking lb2000 caught in the harbour by rod (not the name of the person who caught it ! ).In my teenage years, I had a job on the markets and carried 50lb bags of potatoes. When I think of how heavy that was, I wonder how the catch was even possible.Earlier that morning, I’ve seen some sea kayaks and go down to the shore to investigate. R300 for 2hrs. Money has gone really well on the trip, but from experience, the day before going home, is the time when most people let their guard down and overspend (and sometimes end up sat in an airport with no money to buy coffee !). I continue exploring around the town and decide to get my hair cut. They seem quite surprised, but do a cracking job for R80, which I round up to R100. I pop to the cash point to reload and mentally calculating the exchange rate, I withdraw my cash. I realise that in my head, the decimal point was in the wrong place. Instead of Â£40, I have withdrawn £4, and paid £2.50 for the privilege !. I go back and get the correct amount before making my way to the whale museum.Staff there are really laid back (receptionist is playing cards, on windows 95).The manager explains “Things are pretty formal in the week, but at weekends we don’t give a toss”. I’m growing to love the mannerisms of the Afrikaners. 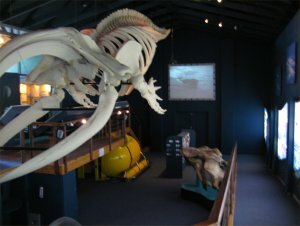 There is a large whale skeleton, but its plastic. 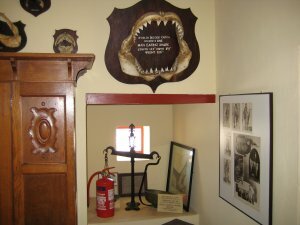 Some of the interesting exhibits make up for it. I debate buying a whale poster. The danger is always buying with the feel good factor, and then getting home and realising that you wasted time and money buying tat. 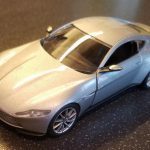 When I buy something, its either put on display in my living room, or stored in a special box for memories, which I open each year on my Birthday and New Years day. I apply this to every souvenir, and if it wont fit into either of these 2 categories, then I simply don’t buy it. I continue exploring and find a boutique shopping mall (while looking for a life is good T-shirt, I don’t already have).I bump into the Ozmonds (the pet name I have found for a charming Australian couple in our group). They have both had their haircut as well !.I just cant find a carved black hippo that I really want to add to my collection of miniature animals. After much searching I find an enamel Zebra. I go back to the hotel and get cleaned up, then head to the Fisherman’s Rest, where we are all meeting for our final evening out.The restaurant has a bar, I grab a bottle of beer and sit quietly in the corner.I think about the book that inspired this trip. The Courtney family, live at a place called Weltevreden (which I have mispronounced for 20 years). It means simply – well satisfied. I decide that’s how I’m feeling. One thing about me, is that when I’m completely relaxed, I sort of shut down, and people who don’t know me, think I’m miserable, when the total opposite is true. The owners jokingly bullied me into having a 2nd photo taken (which you can see by moving over this one) with me smiling. 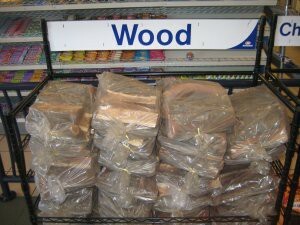 The staff are friendly and good humoured, with an astute knowledge of foul language. I order Steak medallions, the meal is quite delicious. Afterwards we go to a bar called the Zebra crossing. Our waiter joins us and insists on buying everyone a drink !. The next day we drive back to Capetown to the V&A docks, with the intention of visiting Robben Island.As we wander around, I recognise the famous red clock. What isn’t widely known, is that it incorporates a quirky mechanism to measure tidal levels.Its a beautiful day, and a leg of the round-the-world yacht race is being run from here. 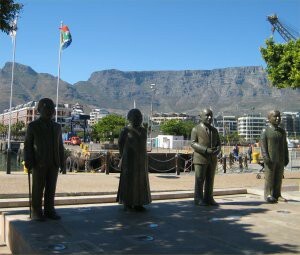 I continue wandering (the boat doesn’t leave for 45 minutes).Away from the bustle of shoppers, amongst a crop of Carob trees, is Nobel Square with Table mountain behind it.It features statues of South Africa’s 4 Nobel Peace Prize Winners. Most people can name the obvious 3. Nelson Mandela and F W De clerk won it jointly, and Archbishop Desmond Tutu. The 4th, is Albert Luthuli a former leader of the ANC. 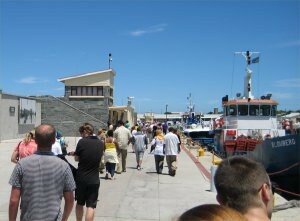 We board the Catamaran for Roben Island. 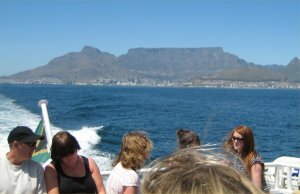 It takes about 40 minutes and I find myself talking to a couple about Hitler.As we travel over, Table mountain is behind us. Its only 8 days since I climbed it, but it feels so long ago now. As we disembark, there was a plaque:While we will not forget the brutality of apartheid, we will not want Robben Island to be a monument to our hardship and suffering. 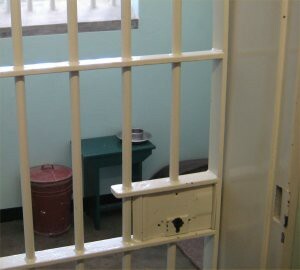 We would want Robben Island to be a monument … reflecting the triumph of the human spirit against the forces of evil. A triumph of non-racialism over bigotry and intolerance. 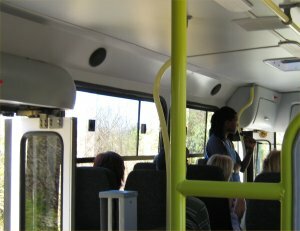 A triumph of a new South Africa over the old.We are shown to 3 buses and given a tour of the island. Our guide is charming and well informed. He explains that the Island was originally a leper colony.He comments that calling lepers, lepers, is wrong, as it brands them as though they asked for the disease.He shows us the house of Robert Sobukwe the leader of the Pan Africanist Congress. He explained that Sobukwe had been detained without charge for 6 years after his sentence ended. He gave an explanation of the group areas act and how the “dompass” permit system was used to control non-whites during apartheid. The prison complex looked a lot more civilised than I had expected, but it was explained that everything changed after 1977 when photo’s of the conditions were smuggled out by the Red Cross. 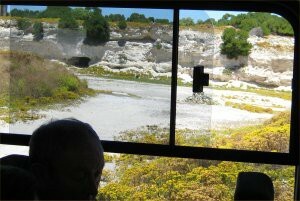 The Lime quarry where inmates were made to mine (it had a serious effect on their health.On the top left of the picture, is the Lime cave. 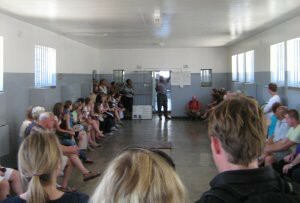 It was used as a lecture theatre to share information about the armed struggle.The prison guards never bothered to check what went on inside, they presumed the the inmates used it as a toilet. We are introduced to a different guide, who explained what daily life was like, food exercise etc.He explained that ordinary criminals had tv and then said simply “our” news was recorded from the radio, so it could be censored.It was obvious that he had been an inmate here as a teenager. 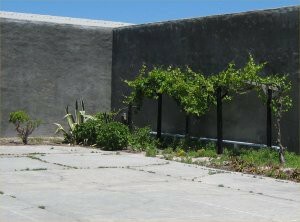 Nelson Mandela’s Garden, where his book The Long Walk to Freedom was written.We walk back to the Jetty. I feel a bit down again. 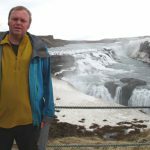 My flight home is in a few hours and I don’t know what’s waiting for me when I get back.Will I find another job in time or will I lose my home ?. Will I have to give up working in IT and leave the vocation I love ?. Its then that it occurs to me. Nelson Mandela lived here for 19 years. He must have looked across the water to the mainland and dreamed every day of simply going home. I decide to stop being selfish. Inspired by my surroundings I reach inside myself and find my determination. I climb onto the deck of the Catamaran, taking the first steps home. Everything is going to be okay.